My mom's birthday is this Tuesday. This is the card that I made for her. 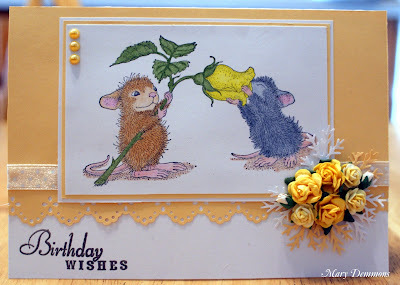 I used this adorable House Mouse Stamp called Everything Is Coming Up Roses for the challenge at House Mouse & Friends (use your favorite House Mouse stamp). I used the color yellow for the challenge at Annabelle Stamps (say it in yellow). Also because it is one of her favorite colors. The paper roses that I added are yellow, pale yellow and white rosebuds. Gorgeous card, cute image and fab colours. Oh what a cute image - love it! Awww love this sweet image stunning colours your mum will sure Love it..great posie of Roses..thanks for sharing with us at HM & Friends Monday chall. This is so cute! Beautiful design and colours! LOVE your adorable image and your design of your card is gorgeous, love it and your beautiful flowers! This is such a cute card! Love that mousey image! This is very pretty, your mom will love it. Thanks for playing in our House Mouse and Friends Monday Challenge. It's such a pretty image how could you fail to love this card!!!! Beautiful! Thanks for playing along again this week...........good luck! I am sure your mom is going to love her card :) Super duper over the top adorable! Beautiful card , love the pretty flowers and your mum is sure to love it. Thanks so much for playing along with us at AnnaBelle Stamps! What a sweet little card! I adore the cluster of roses! Thanks for taking on our no PP challenge at Frosted Designs this week! so cute! love the cluster of flowers! thanks for playing along with us at the Shoe! Suh a pretty card, lovely colours and I'm sure your Mum will love it! Hope your Mom had a great birthday. I know she will enjoy this card! Such a pretty layout! Thanks for sharing with us at House Mouse and Friends Monday Challenge!